HAMPTON, Va. (AP) — Melania Trump made history Wednesday by flying in a V-22 Osprey aircraft and onto the deck of an aircraft carrier. The White House says it’s the first time a first lady has flown in an Osprey. The tiltrotor aircraft takes off and lands vertically. Mrs. Trump flew from Joint Base Anacostia-Bolling in Washington to Joint Base Langley-Eustis in Hampton, Virginia, and onto the deck of the USS George H.W. Bush and back. She later tweeted about her “incredible flight” and visit with service members. 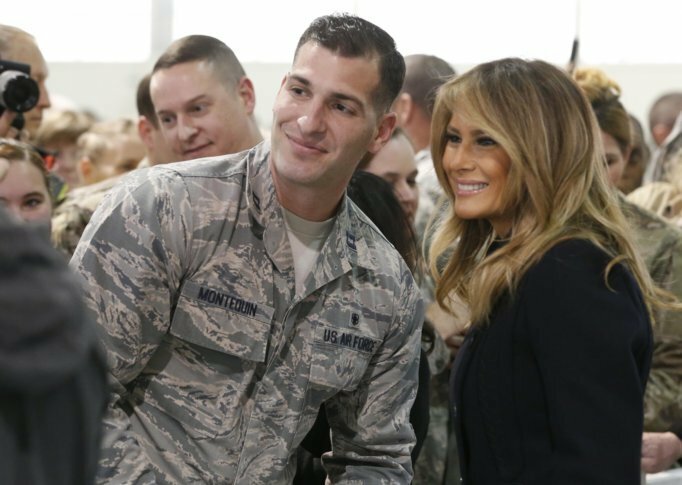 Mrs. Trump’s stops at a pair of military bases Wednesday came during an unusually busy week of public appearances for the first lady. On Thursday, she planned to continue a decades-old tradition of first ladies reading to patients at Children’s National hospital in Washington. Superville reported from Washington. Associated Press writer Ben Finley in Norfolk, Virginia, contributed to this report.